There is a growing movement towards tiny homes like this small but spacious house in Japan but this 850 sq. ft. getaway will transport you to another world. 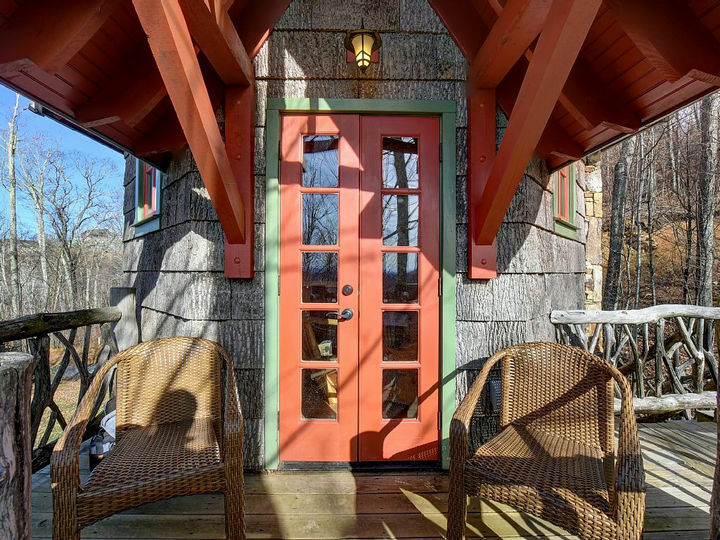 It is called the ‘Hobbit House’ and you will feel like you are living in a magical place. 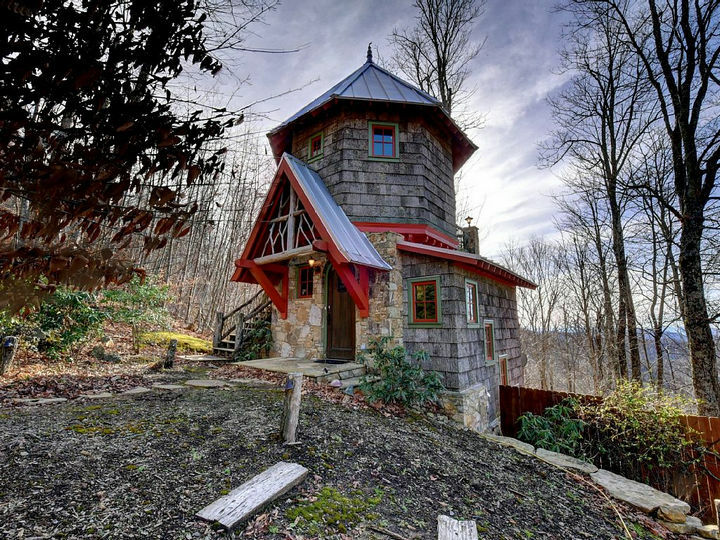 It is located in the Mars Hill area of North Carolina and the hobbit house was built high up in the blue ridge mountains (4,000 feet up to be exact!). 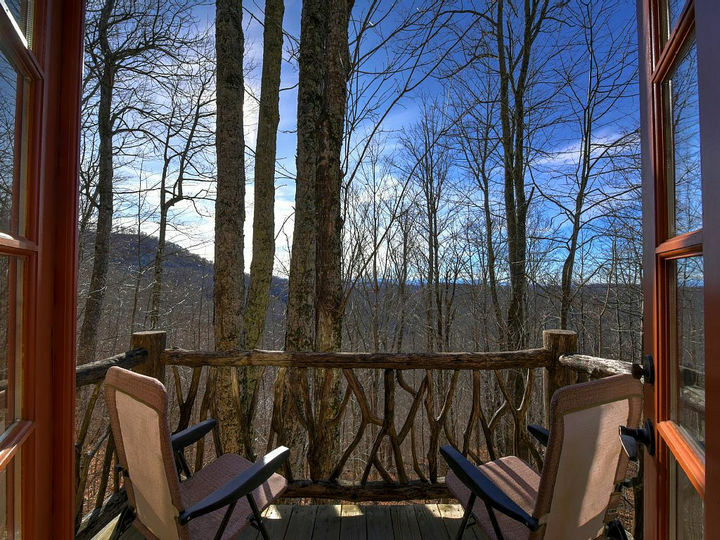 The view is amazing and it also is available for rent during the winter and summer months from Carolina Mornings. 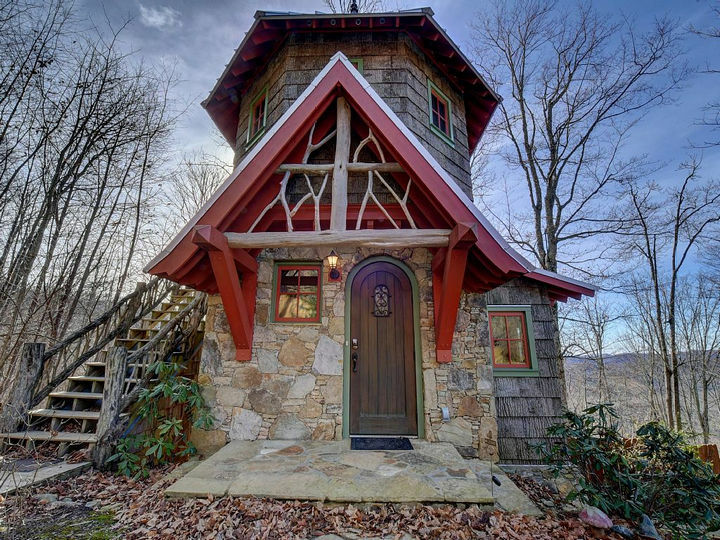 Behold the Hobbit House, a mini castle built 4,000 feet up in the Blue Ridge Mountains. Simply looking at it transports you to a fantasy world and it was inspired by ‘The Lord of the Rings’. 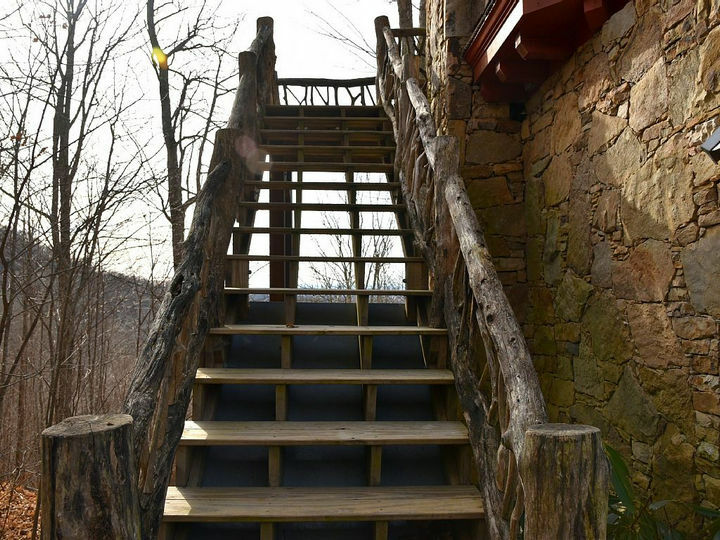 It looks like a castle but also has cabin-like features such as these wooden stairs. Once you reach the top, it has a whimsical feel that makes you want to explore it further. A beautiful rustic deck overlooks the beauty of the Blue Ridge Mountains. 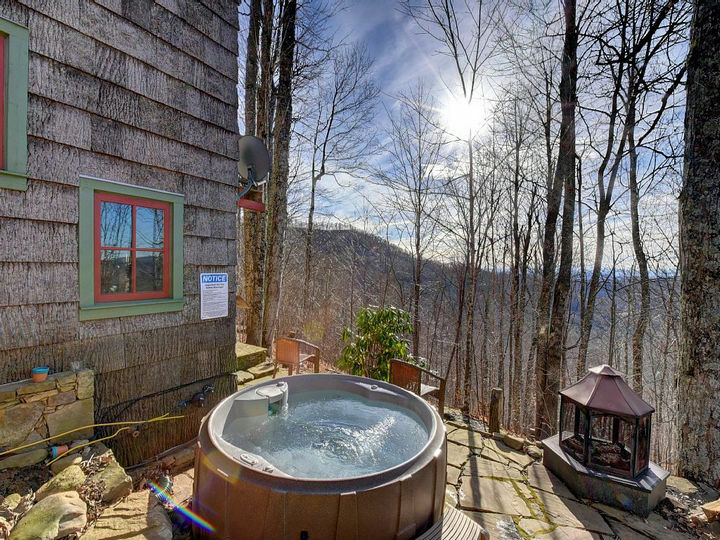 It has modern amenities like this gorgeous hot tub for outdoor entertaining. 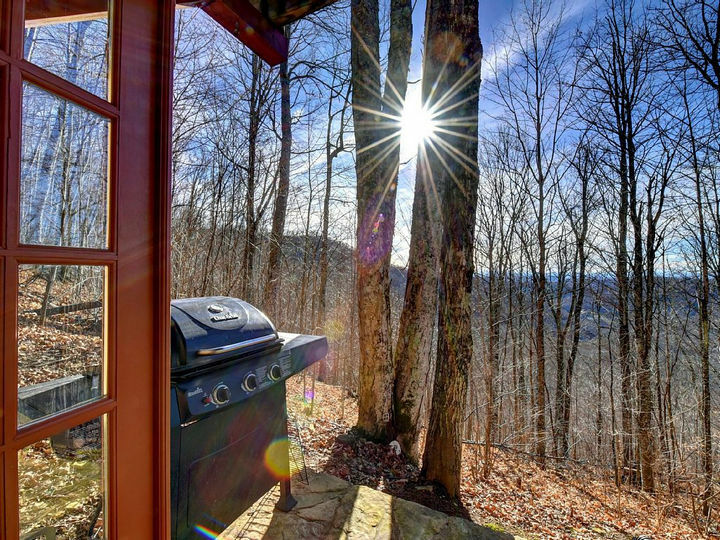 Grilling has never looked and felt better in the crisp mountain air. The main entrance opens up to a beautiful view of the interior. 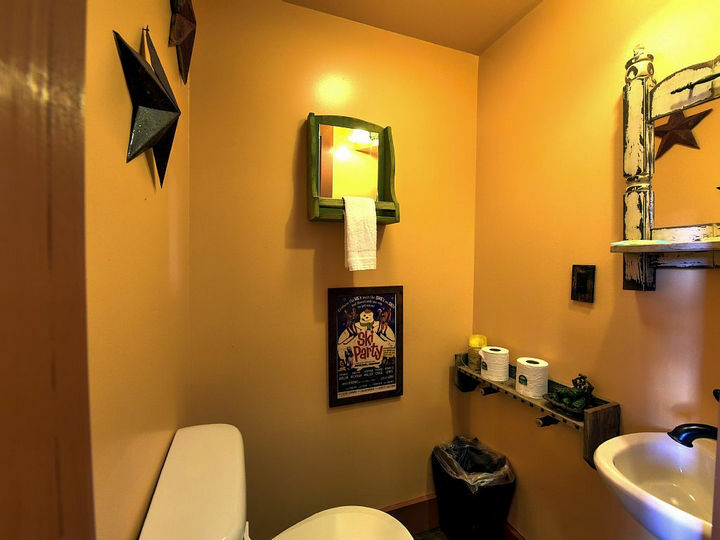 As you make your way down the hobbit hole, you’ll encounter a cozy kitchen and living room area. 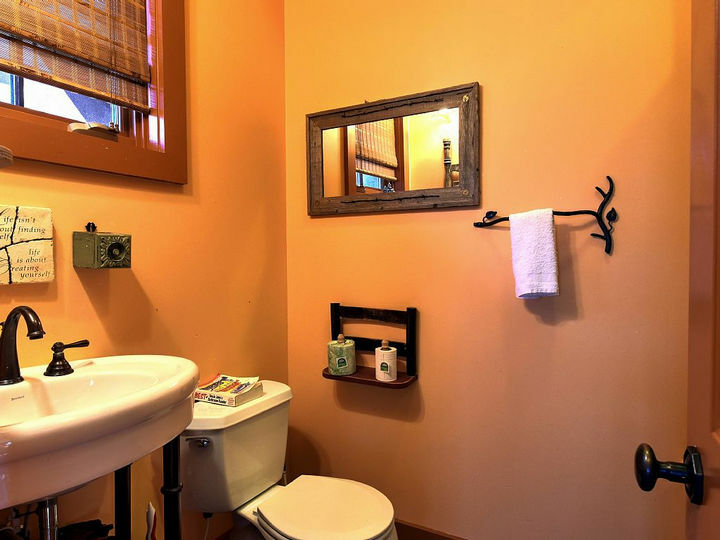 Even castles need modern plumbing and each floor has a full washroom. 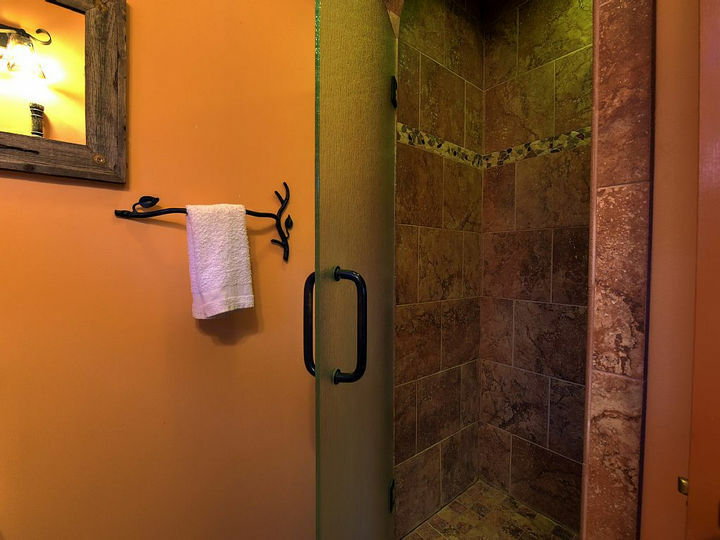 And there is also a large ornate shower to feel fresh for your outdoor excursions. 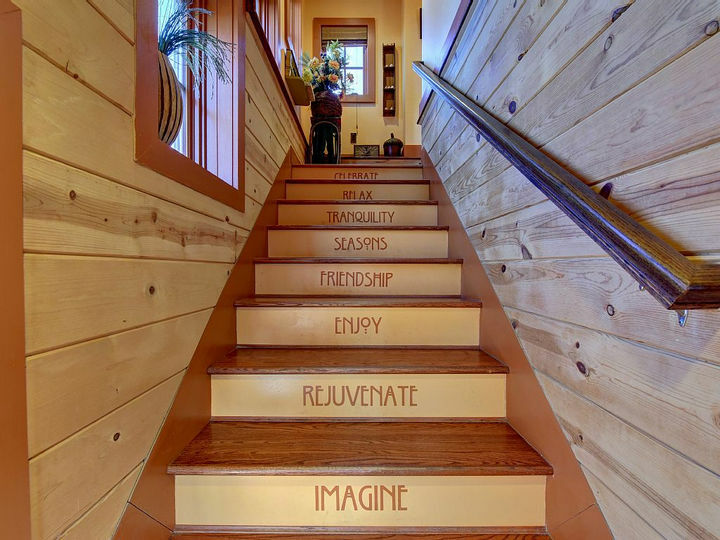 There is attention to detail everywhere and these stairs truly define what staying at the Hobbit House is all about. 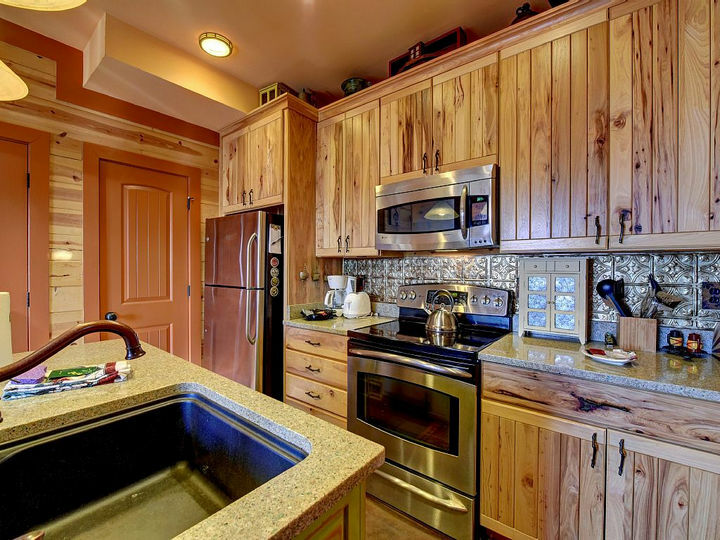 The kitchen still keeps the rustic feel but has the convenience of modern appliances and amenities. 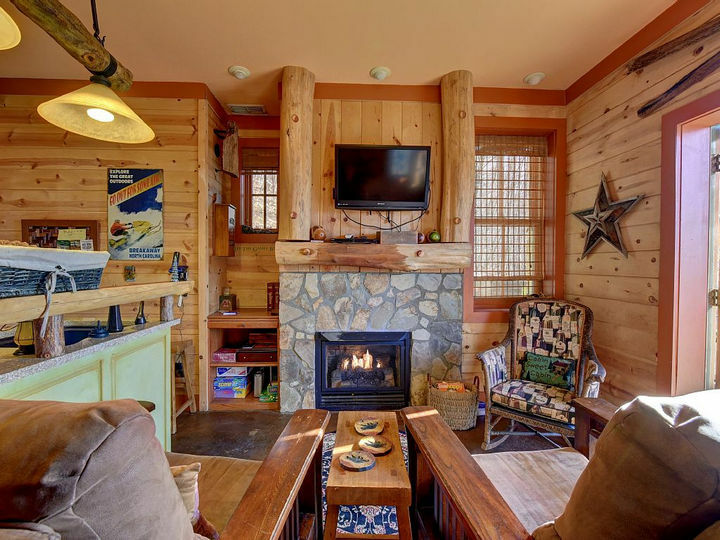 The living area is the perfect place for a cozy evening by the fireplace. 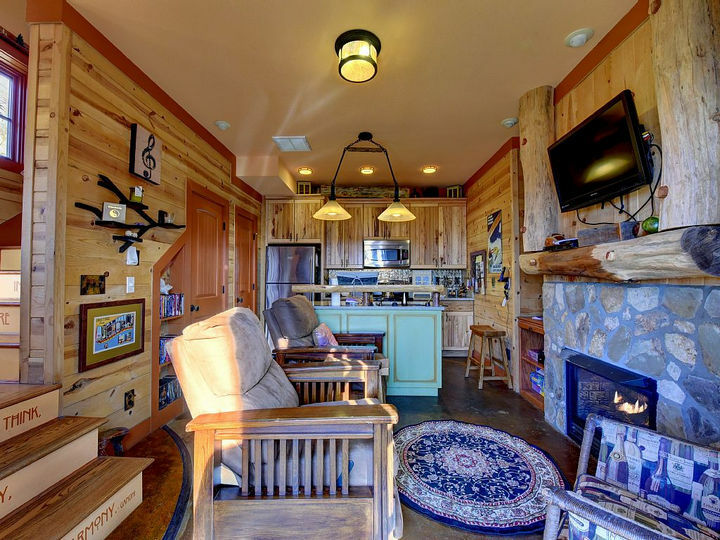 As you make your way up to the third floor, you’ll find 2 bedrooms that are as unique as this cabin. 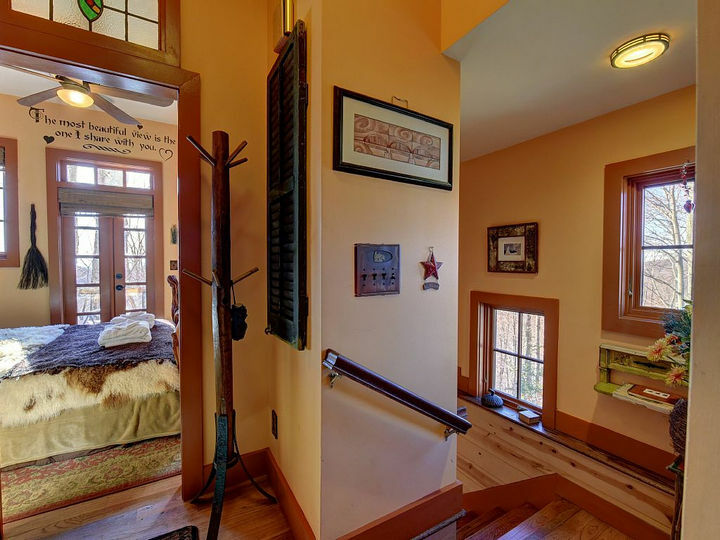 The ladder on the left leads up to a fun kid’s room and the main bedroom can be seen straight ahead. 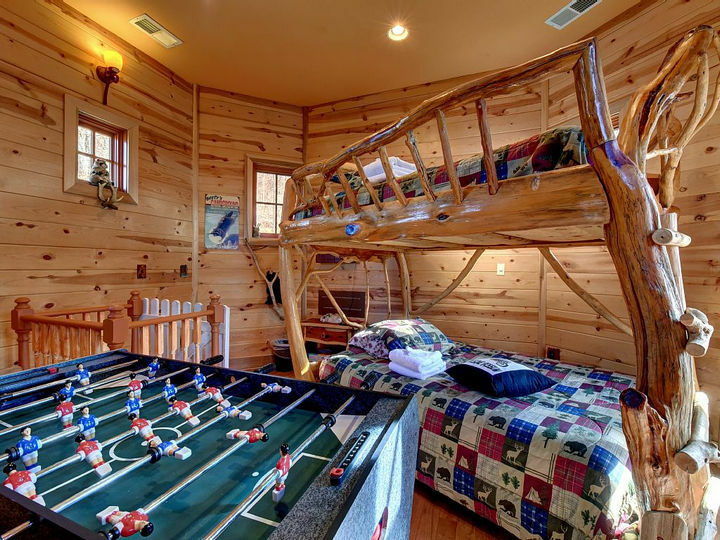 This kid’s room features custom log bunk beds and a foosball table. 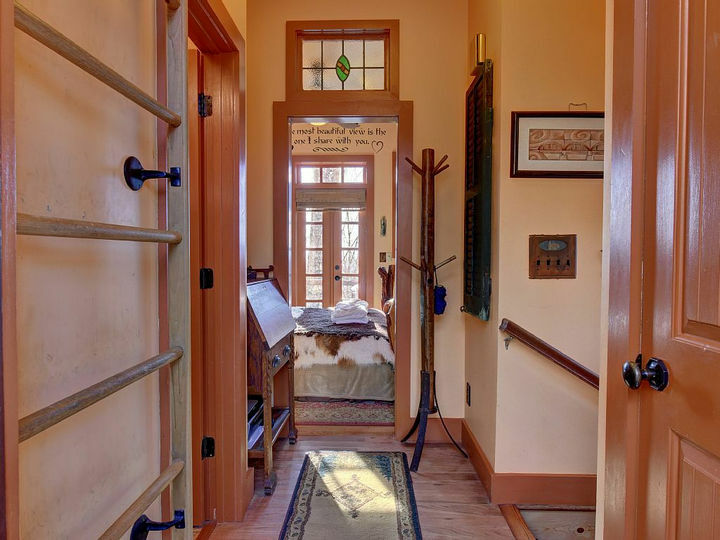 There is also a door leading outside or a fun ladder (see picture above) that leads you to the second floor. 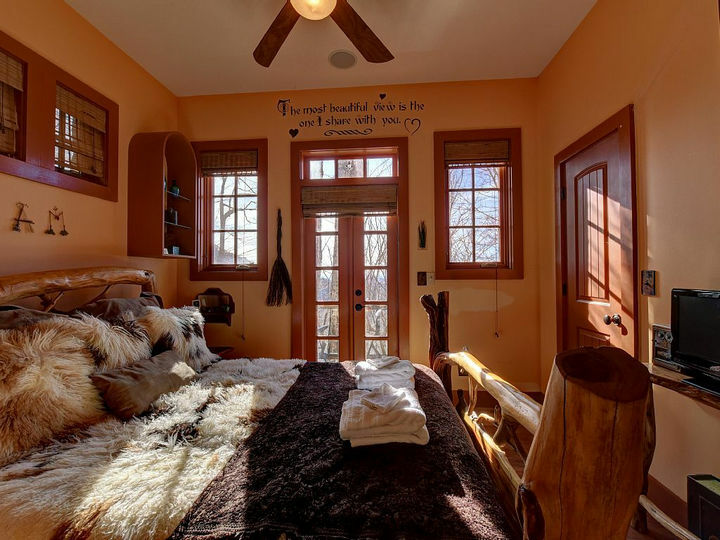 The main bedroom features a king-sized bed with a heartwarming message above the door, “The most beautiful view is the one I share with you”. 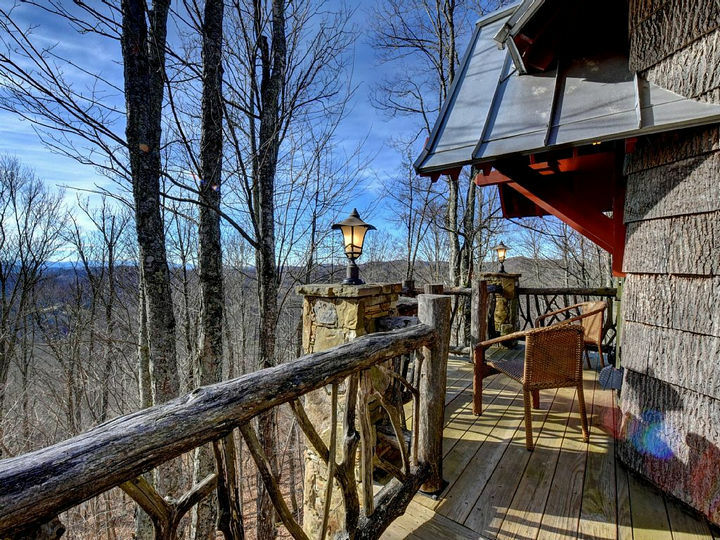 Even Frodo Baggins would approve of this million dollar view! 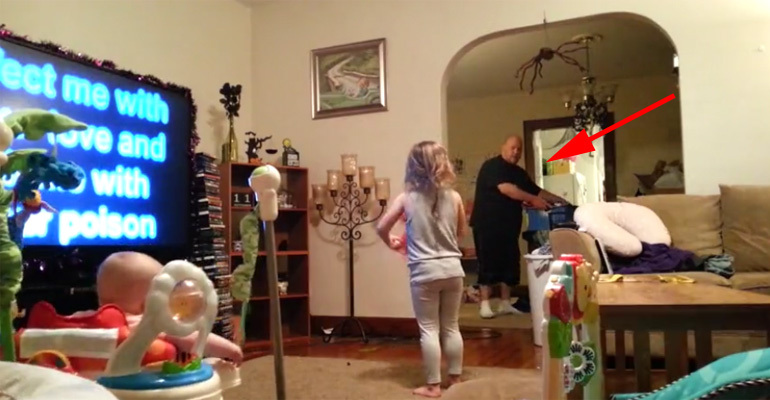 Such a great escape that makes you feel like you’re living in a fantasy world. 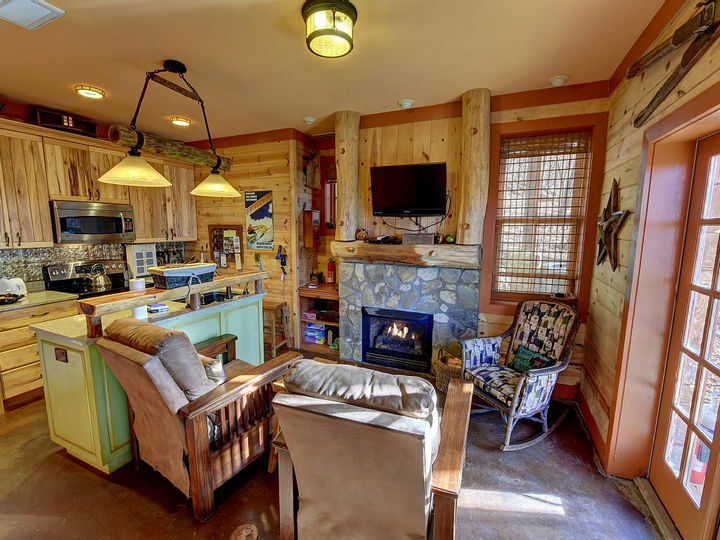 If you are even in the area and want to experience the Hobbit House for yourself, please visit Carolina Mornings for booking information. Please share this incredible Hobbit House with your friends and family. 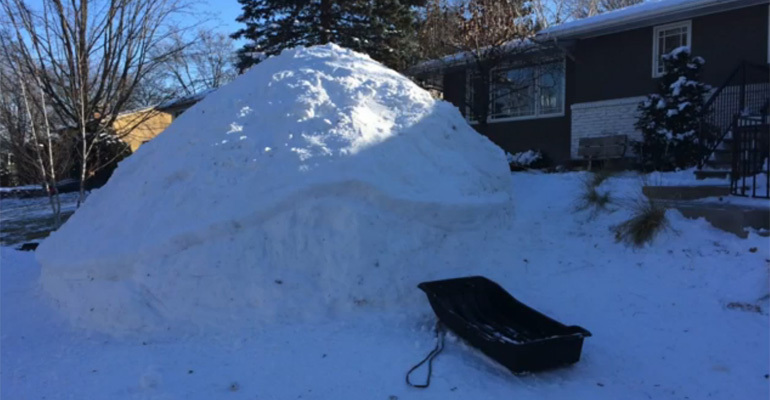 Three Brothers Wanted to Turn This Huge Mound of Snow into Something Epic and They Nailed It.